Prominent & Leading Manufacturer from Bengaluru, we offer fully automatic water softener. We are engaged in manufacturing and supplying wide range of Water Softener.Based on latest technology, our hard water softener is designed in a way that it produces only treated water. 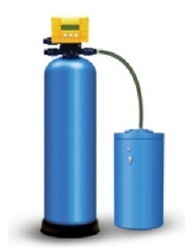 We assure our clients that a quality tested assortment of Hard Water Softener is delivered from our end. Prolongs the Life of Water Heaters, Ice makers, Dishwashers, Coffeemakers and Plumbing Fixtures. The Hard water flows over resin in the resin tank. Resin is in the form of tiny beads that have a special food grade chemical property. At low concentration of sodium in typical hard water, the resin beads absorb (combine with them) the hardness of water and replace it with an equivalent amount of sodium in water. As hardness is removed, the water becomes "soft". The resin has a fixed capacity of the amount of hardness it can remove. Once that happens the resin can no longer remove the water hardness and the resin is called "saturated" or exhausted. Hard water softener, the same resin when exposed to high sodium chloride (common salt) concentration reverses the process, absorbs the sodium, and releases the hardness. This property is utilized in regenerating the exhausted resin. This is done by temporarily stopping the softening process and exposing the resin to high salt solution from the brine tank. The entire process is controlled by the fully automatic controller valve which works either on time of regeneration (normally set at 2 AM) or by a meter valve inside the controller, preset to a calculated amount of water that can be softened before regeneration. After regeneration the controller rinses the resin to remove all salt not absorbed by the resin. The entire cycle lasts less than 1 hour. The softening process adds a very small amount of sodium in the water, which comes from the exchange process. It is not directly added from the brine tank. For example, water with 10-grain hardness will have a sodium addition of 80 ppm in the water after softening.